Las Vegas Sands Corp. (LVS – Free Report)	stock has climbed 4% since it reported its Q4 and fiscal 2018 financial results on January 23. Despite the casino and resort firm’s post-earnings jump, shares of LVS have fallen 17% in the last year as Wall Street’s concerns about the broader industry heat up. Las Vegas Sands owns The Venetian and The Palazzo resorts in Las Vegas, along with a property in Singapore and multiple properties on the Cotai Strip in Macau. The company has continued to invest in all of its markets and has remained positive about its opportunities in Macau. Las Vegas Sands executives said the firm is moving forward with investments in the many of their operations in Macau. In Macau, like in Las Vegas, the firm also operates retail businesses and entertainment attractions, which LVS thinks will help it grow in Macau for years to come. But Las Vegas Sands is set to face a possible slowdown in Macau as the broader Chinese economy suffers. Many industry analysts expect the southern Chinese territory, which is currently the world’s largest gambling region, to see revenues fall slightly in 2019 after two years of double-digit growth. Even the smallest downturn in Macau could hurt casino operators since the region pulled in $37 billion in 2018 against $6.6 billion in Las Vegas. More specially, the region’s high-rollers, which account for nearly half of global gambling revenues, might decrease their spending. But Las Vegas Sands’ portfolio of properties in the area are said to be better positioned than others as they also accommodate more casual gamblers. 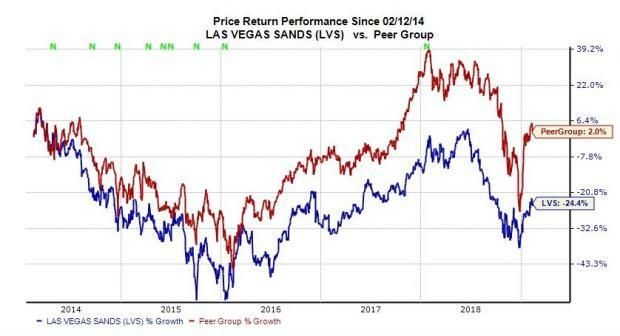 As we touched on at the top, shares of LVS are down roughly 17% over the last 12 months, which falls below its peer group’s—which includes MGM Resorts (MGM – Free Report)	, Caesars Entertainment CRV, Wynn Resorts (WYNN – Free Report)	, Melco (MLCO – Free Report)	, and others—roughly 15% average decline. The S&P 500 has climbed approximately 2% during this stretch. We can also see that LVS stock has lagged its industry over the last five years. Las Vegas Sands shares closed regular trading up 1.00% to $59.60 a share Monday, which marked a roughly 27% downturn from their 52-week high of $81.45 per share. Las Vegas Sands saw its fourth-quarter revenues pop 2.5% to reach $3.46 billion. This not only fell just short of our Zacks Consensus Estimate it also marked a slow down from the year-ago period’s nearly 12% top-line expansion. Looking ahead, LVS’ fiscal Q1 2019 revenues are projected to dip 2.3% to reach $3.50 billion, based on our current estimates. Meanwhile, the firm’s current full-year revenues are expected to slip roughly 0.45%. Things look even worse for LVS at the bottom end of the income statement. The company’s adjusted Q1 earnings are expected to sink 20.2% from the prior-year period to touch $0.83 a share. This comes after Las Vegas Sands’ fourth-quarter earnings slipped 12.5%. LVS’ full-year 2019 earnings are expected to fall 4.2% from fiscal 2018. Plus, the chart below shows investors just how much LVS’ bottom-line outlook has declined recently. 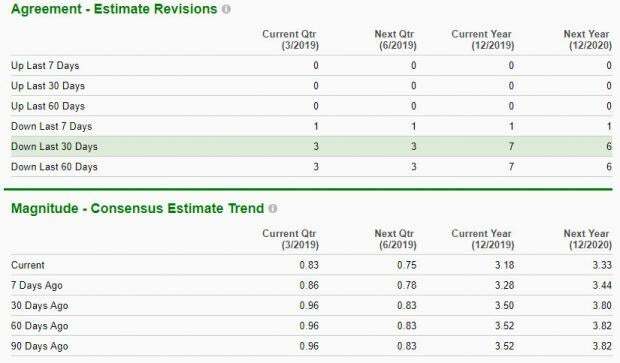 We can see that the company’s earnings picture has fallen during the last 30 days, with estimates coming down even more in the past seven days. And we know that falling earnings rarely signals good things to come for stocks. Las Vegas Sands is currently a Zacks Rank #5 (Strong Sell) based on its recent wave of downward earnings estimate revision activity. Investors still interested in the casino and gambling industry might instead want to consider Churchill Downs (CHDN – Free Report)	and Red Rock Resorts (RRR – Free Report)	, which are both currently Zacks Rank #2 (Buy) stocks. Automotive Wheel Market worth $100bn by 2024: Global Market Insights, Inc.